So, I got exactly two days into the week-long blogging exercise. My main excuse is that I had to go out of town unexpectedly Thursday to Saturday, but that really only excuses me from two days! The Day 3 exercise was to produce an infographic of some sort. My idea was to make a Venn diagram showing the intersection of socks, lace, and pink yarn in my projects, but I had a problem finding a Venn diagram-maker that (a) was free and (b) could deal with three concepts. I will admit that, despite this failure, I LOVE Venn diagrams and Boolean logic. I remember learning about Boolean logic in 6th grade and, for the first time, being interested in math. However, I didn't see any possible use in my future life for it. Little did I know that I would become a librarian and use Boolean logic constantly in complex MEDLINE searches! So, although I fell down on blogging, I did cast on for a new project over the weekend, and it is neither pink nor socks. It does involve some lace, though. The pattern is Cladonia, which I think I queued the week it was first published! 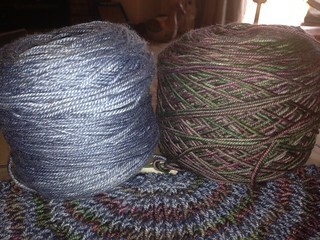 The blue yarn is madelinetosh pashmina in Betty Draper's Blues, and the other is Blue Moon Socks That Rock Heavyweight in Corvid Fledge. In person, the Corvid Fledge looks much more purple. The lace edging will be in Betty Draper's Blues. I'll be taking this project to my conference that begins Saturday in Boston. I'm also taking a sock, for a little more portability! Good colors! Have fun in Boston, and don't worry about time getting away from you. If it helps, the Captcha phrase I had to type was "industrious retryng"